History is anything but boring as families experience entertaining, interactive exhibits and amazing hands-on opportunities by visiting top historic attractions in Kansas City with kids! 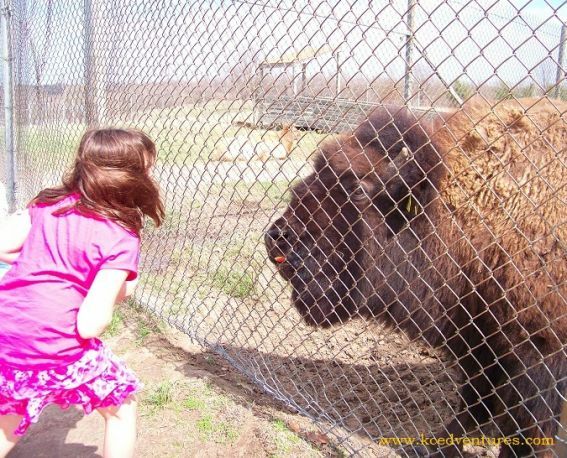 One of Kansas City’s hidden history gems, kids can come face-to-face with bison (similar to buffalo) at the Native Hoofed Animal Exhibit located in Fleming Park at Lake Jacomo. Bison, which used to be native to the Midwest and free-roamed the plains prior to the mid-1800s, are now only able to be viewed in national parks and animal preserves such as this one. Along with a herd of bison, elk also call the enclosure home. Both the elk and bison roam the enclosure and will frequently come to the front of the fenced area to be fed. Make sure to bring a few apples and carrots, which are a favorite snack. Pictures are a must! A yearly favorite, Deanna Rose Farmstead is a very popular attraction that offers visitors a look at turn-of-the-century farm and prairie life. It reminds me of the town and life of Laura Ingalls, author of the Little House book series. We always enjoy a day at the farmstead as there’s always something new to see. 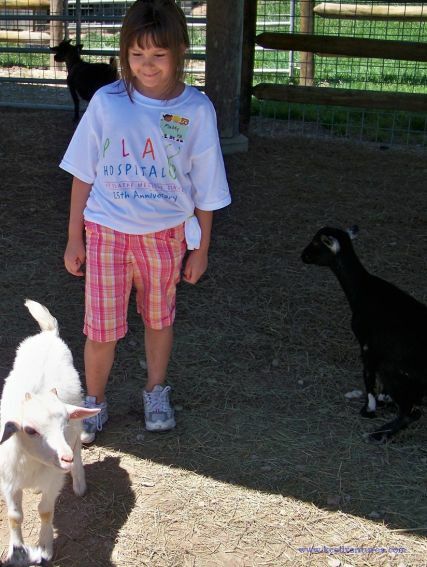 It’s home to more than 200 animals including cows, goats, chickens, prairie dogs, horses, bunnies, and many more kid-favorites. And again, hands-on history rules here! Kids can bottle-feed baby goats, experience one of the daily milking times at the Dairy Barn, attend lessons at the one-room Schoolhouse, fish with cane poles, tour a Kanza Indian encampment, ride horses, and visit the General Store and Ice Cream Shop for a treat. Before you begin your visit, stop by Ben’s Bank to pick up a passport that challenges kids to find the answers to clues scattered throughout the prairie town. With only 13 presidential libraries across the country, we were very excited to visit the Harry S. Truman Library and Museum right here in our own hometown! Our first surprise was the replica of the Liberty Bell that’s housed outside on the library grounds. I was a little concerned with keeping my 8-year-old occupied as we toured the museum. We were extremely pleased to see all of the interactive exhibits available at the museum! Kids are able to make a campaign button, create a desk sign, dress-up like Harry and Bess when they were children, play interactive trivia games, and do puzzles to understand more about life in the 1940s. We were all interested in ‘The Whistlestop Exhibit’ which allows visitors to listen to messages via old-time telephones. Visitors will also be intrigued to learn about what families and children had to endure during wartime (such as food shortages and blackouts) when they tour the outstanding timeline gallery. 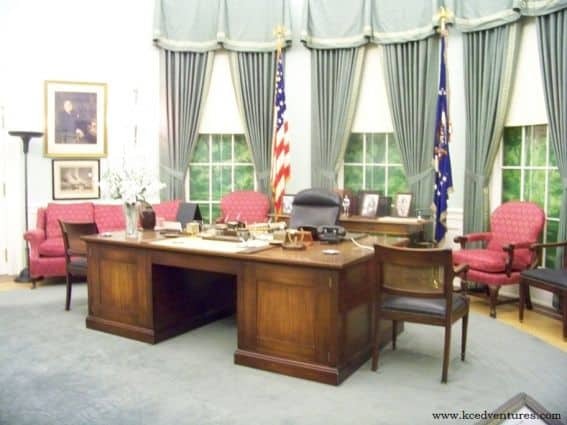 And, of course, you won’t want to leave until you see the a replica of the Oval Office as it was during Truman’s term—a little bit of Washington DC right here in the middle of the country! Located in St. Joseph, 30 miles north of Kansas City, the Pony Express Museum allows families to learn about a key part of our county’s history—the first long-distance communication network. Kids can experience what it was like to be a rider on the Pony Express trails. An interactive, panoramic exhibit allows visitors to experience what riders had to endure on their 10-day excursion (our favorite was the section that smelled like a pine forest!). Kids will enjoy being able to pump water from a well dug under the building, hop on a saddle, tour a cabin to see how riders would live while transporting mail, and create their own ‘Pony Express’ letters. The museum also has an amazing play area for young children with many toys and activities that represent life in the late 1800s. Kansas City is also home to one of the last remaining stagecoach stops in America. Mahaffie Stagecoach Stop & Farm is open to the public and located on the historic Santa Fe Trail (one of three trails used by pioneers during the westward movement). Families are able to experience what travel was like in the 1860s with no cars and highways, just a stagecoach and lots of dirt trails. Costumed interpreters and hands-on exhibits allow you to learn about life in the late 1800s. Visitors can enjoy a ride on the old stagecoach, tour the house that served as a restaurant and overnight stop for so many travelers, visit with the animals and learn about farm life, and if you’re lucky, they’ll even let you participate in a few farm chores! The National Agriculture Center is dedicated to educating us about farming and our food. The motto of the National Ag is, “If you eat, you are involved in agriculture!” The center includes five buildings along with a prairie town where families can learn about all aspects of how our food gets from farm to table. The dairy exhibits allow hands-on fun as you learn about cows and milking. 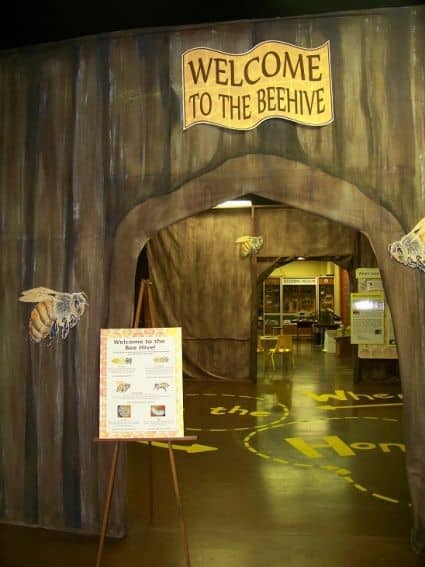 In the main building, kids can ‘buzz’ through the huge beehive room, play beekeeper and learn about the science of honey. And, a visit to Smith House and the prairie town isn’t complete without doing a few farm chores such as grinding corn, wringing the laundry, and feeding the chickens. If you have a truck lover in the family, you’ll also want to tour the barn that houses a huge collection of tractors, trucks, and antique vehicles. And no visit is complete without a picture on the 2-story rooster! As you walk down the long, unpaved road to enter this living history museum, you can feel yourself traveling back in time. Families will enjoy touring the Missouri Town 1855 which consists of 25 buildings dating from 1820 to 1860. I recommend going during special events or on summer weekends as that is when the town offers more hands-on activities. 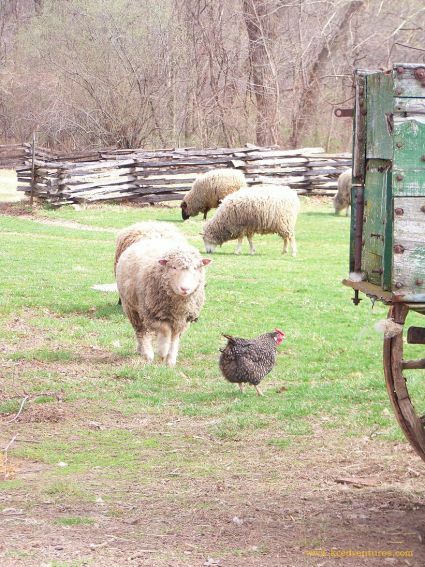 Kids love to see the sheep and chickens that freely roam the grounds, along with the horses and steer in the corral. Visiting on a day when he sheep are being sheared is a treat! Another favorite is a visit to the blacksmith’s shop where visitors are able to watch the work of a trained blacksmith. Costumed interpreters also share skills from the past such as cooking, farming, and keeping house. Have you ever wondered what it was like to ‘Go West, Young Pioneer’? 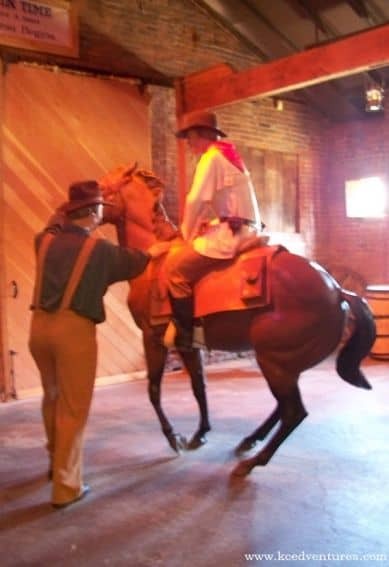 You can experience the thrills and hardships that were familiar to many of our ancestors at the National Frontier Trails Museum. The introduction to the museum offers a nice look at Lewis & Clark and their adventures blazing a trail to the west. 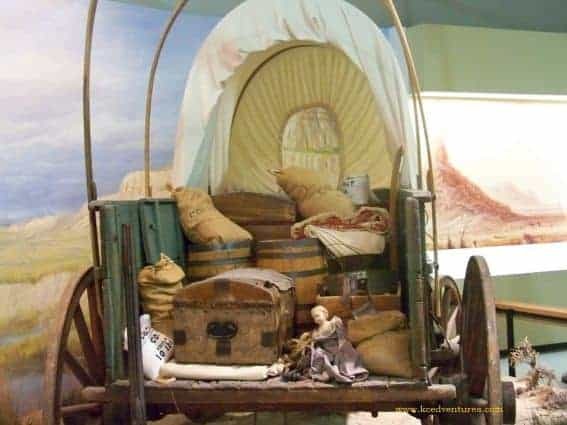 A tour of the museum winds through galleries that contain many artifacts from the mid-1800’s with the highlights being the hands-on exhibits that allows kids to pack a wagon or saddle. 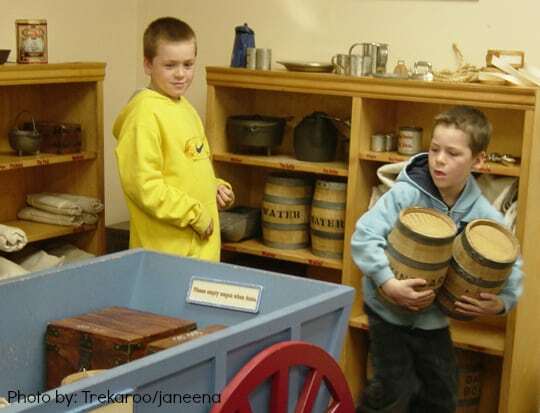 Visitors are able to handle items such as cast iron pots, sacks of flour, and as they choose which items they think are most important to their trip. The museum also offers diary entries written by children who traveled the trails, which we found very interesting (my kids both looked for entries written by children their own age). On the weekends, visitors can experience a covered wagon ride. And there is a very extensive gift shop with many games, toys and books’ showcasing what life was like for children in the mid 1800’s. Families will enjoy a trip back to the old west during their visit at Patee House. The historic building was a luxury hotel that began in 1858 and served as headquarters for the Pony Express in 1860. At the front desk, we asked for a scavenger hunt and had a great time looking for clues as we toured our way through more than 20 rooms of exhibits. 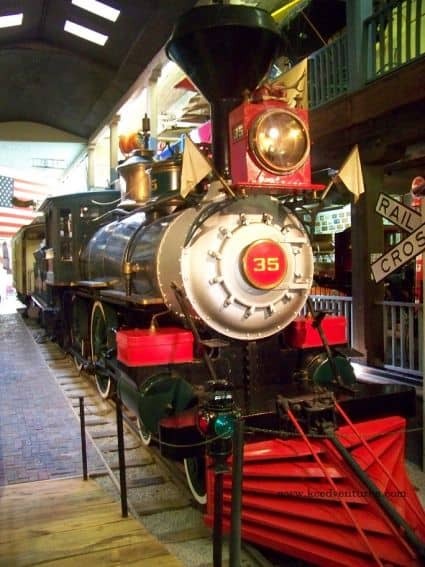 Kids can ride a vintage carousel, climb aboard a full-sized train engine, and enjoy a sarsaparilla and popcorn in the re-created Wild West Saloon. The Patee House is also listed in the book 1,001 Places to see in the USA & Canada Before You Die. When you turn in your completed scavenger hunt, you will be awarded a share of stock in the Hannibal and St. Joseph Railroad—a fun stock certificate is made out in your child’s name as a great memento of your visit! Want to Visit Kansas City With Kids? 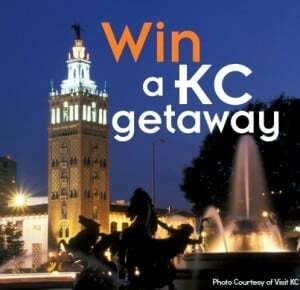 Enter to win our Kansas City family-friendly getaway! Explore Kid-Friendly Attractions in the heart of the city. Discover the Metropolitan side of KC: art, theater, music, and more. Jacquie Fisher is a mom to two adventurous kids, an educator, and founder of Edventures with Kids. One of her lifetime travel goals is to visit all 50 states. She loves to encourage families to get outside and explore nature, and frequently blogs about fun learning activities and family travel.